Star Trek fans have known and loved Brent Spiner for his portrayal as Data on The Next Generation – and now fans from all over the world can spend an evening with Brent in a whole new way! Presenting for the first time in Las Vegas in its entirety, this very special Saturday Night Gala features Brent performing a selection of songs with his live band. It will be an experience attendees will never forget, but don’t take our word for it -- here’s what Brent has to say about it!! The Saturday Night Gala is included on a complimentary basis for GOLD, CAPTAIN’S CHAIR or COPPER Package patrons who can keep their same seats they had during the day. For those who do not have the Saturday Night Gala included in your admission package as above or are not attending the convention at all, you can still attend the Gala by purchasing a separate ticket for $60. Note: The Gala ticket does not include admission to the convention. Join Star Trek: The Motion Picture’s Special Effects Supervisor and Oscar-Nominee Douglas Trumbull -- whose career highlights include 2001: A Space Odyssey, Close Encounters of the Third Kind, Blade Runner and one of the pioneers of IMAX -- and our illustrious panel of FX experts Rick Sternbach (illustrator for Star Trek: The Motion Picture), Doug Drexler, and Michael and Denise Okuda as we look back at this ambitious and under-appreciated epic film. One of our favorite things about the Official STAR TREK Conventions is the performance extras that we are able to offer thanks to the talent and generosity of our celebrity guests. We are thrilled to announce that RENE AUBERJONOIS and NANA VISITOR will be reunited on stage to perform a play for us entitled CROSS OUR HEARTS: Poems and Prose Read by Nana and Rene. 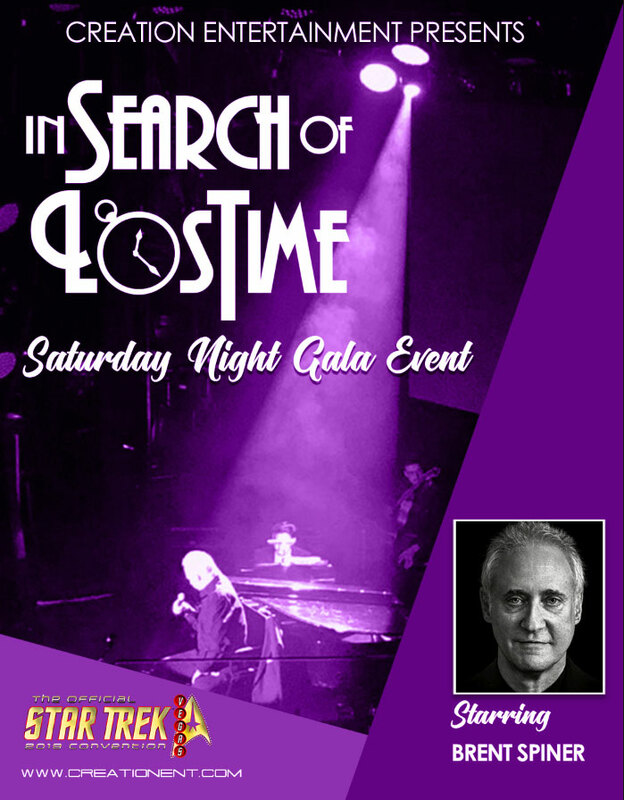 While we are all familiar with Rene and Nana's television work, both have starred on Broadway and we're delighted to welcome them to Star Trek Las Vegas stage to perform their original play at our exclusive Thursday Night Dinner Party. This dinner party is exclusive to all Gold Patrons plus the Captain’s Chair Patrons who purchased their ticket at the 2018 STLV Upgrade session who will be seated to the rear or sides of the Theatre. Join Chase Masterson -- best known as Leeta, the lovely Bajoran Dabo girl from Star Trek: Deep Space Nine -- for some Happy Hour festivities! The drinks and conversation take place at Quark’s Bar right after the vendors room closes, Wednesday through Saturday, for ONE hour. Stop by, order one of your favorite drinks, and relax while watching the talented Chase perform. Plus, some surprise stars might just show up for a toast. Remember ID's will be checked. Cheers! OUR FAMOUS KARAOKE PARTY - On THURSDAY NIGHT in our Secondary Theatre, YOU may get the chance to be a singing star at our famous Karaoke Party! Connor Trinneer ("Commander Charles 'Trip' Tucker III") and Dominic Keating ("Lieutenant Malcolm Reed") will be on hand to host the fun-filled party, and there could also be some celebrity drop-ins as well! The best part is it’s FREE ADMISSION for all and you don’t need a convention ticket, so don’t miss out! Please note: While signing up is not a guarantee, you must sign up IN ADVANCE if you want a chance to participate in the KARAOKE party. There will be NO SIGN-UPS at the party. HIGH ENERGY, FUN SONGS ARE ENCOURAGED! Please choose only ONE SONG and write down your FULL NAME. Groups can be up to 4 people MAX. Please write down FULL NAMES OF ALL PEOPLE. Slips with partial names will not be accepted. If people submit the same song, one slip is chosen at random. Sign-up times will be listed in our Event Schedule! 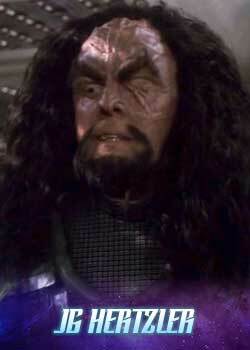 KLINGON KARAOKE PARTY - On FRIDAY NIGHT, let’s get our Klingon vocals on! In this super-fun FREE Karaoke Party, taking place in our Secondary Theatre, join Klingon hosts J.G. 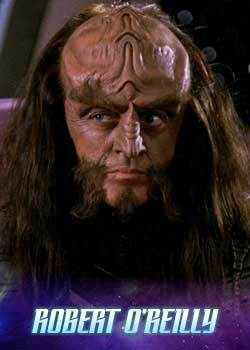 Hertzler ("Martok") and Robert O’Reilly ("Gowron"), who will both be in makeup and costume, for a rousing good time. Plus, you never know who might show up as a surprise guest! 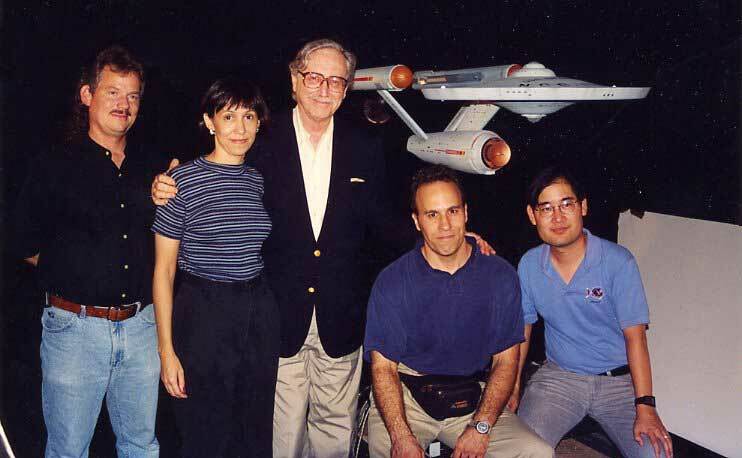 Celebrate glorious continuity with members of the Star Trek: Deep Space Nine Art and Visual Effects Department, namely Michael and Denise Okuda, Doug Drexler, and Judy Elkins, as they explore the making of fan favorite, and Star Trek high water mark, "Trials and Tribble-ations". “Trials…” is one of the most beloved episodes of all time, the undisputed gold standard for fan happiness and delight across the board. There is probably no other Star Trek episode that so embodies a sense of fun, retro nostalgia, and fulfillment like "Trials and Tribble-ations". Continuity is the corner stone of Star Trek's popularity and foundation, and it is the joy of knowing it's history, it's taste, and it's texture, dramatically and aesthetically that makes this episode a standout. “Trial and Tribble-ations” does not disappoint. So explore this masterpiece of continuity and joy with the art department that made sure it towed the line aesthetically from stem to stern. The fidelity of the sets, the props, the uniforms and the starships, demonstrates a level of craft and understanding that goes beyond just doing a job. It's love. Even before NASA and Star Trek existed, filmmakers looked to the aeronautical industry, organizations involved in rocket experiments, and astronomers to aid them in depicting flights to other worlds. The Buck Rogers and Flash Gordon serials treated audiences to space travel in rocket ships to encounter those “new civilizations” we’re so familiar with today, with both good and bad results. Early movies, such as the 1929 Frau im Mond and the 1936 Things to Come, also primed us for more adventures beyond Earth, with films like Captain Video series; Tom Corbett, Space Cadet; Destination Moon; Forbidden Planet and countless others, as art departments (with wildly varying budgets) designed sets and props and spaceship models. The practice continued with Star Trek, which first aired over 50 years ago, and barely eight years after NASA itself was formed. 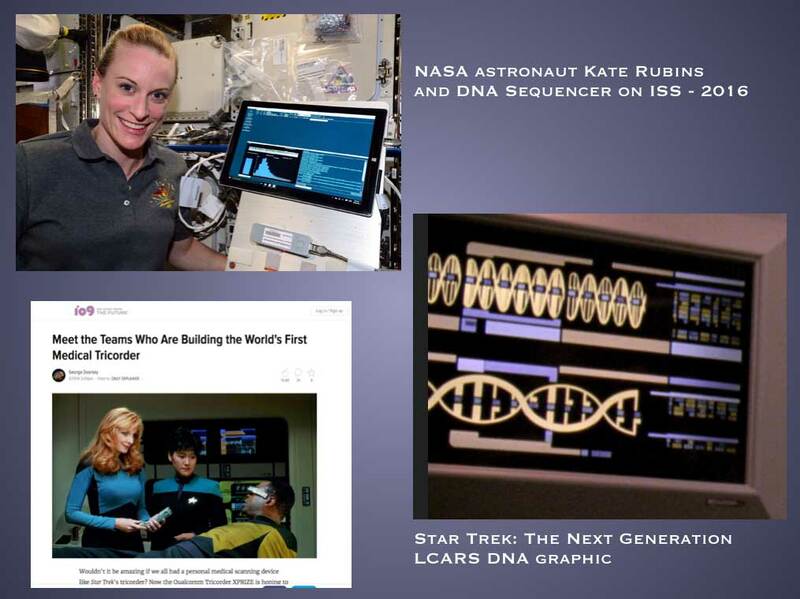 This presentation will examine many of the concepts developed for Star Trek, both human and alien, with particular emphasis on their scientific and technological plausibility, even in the 24-century. 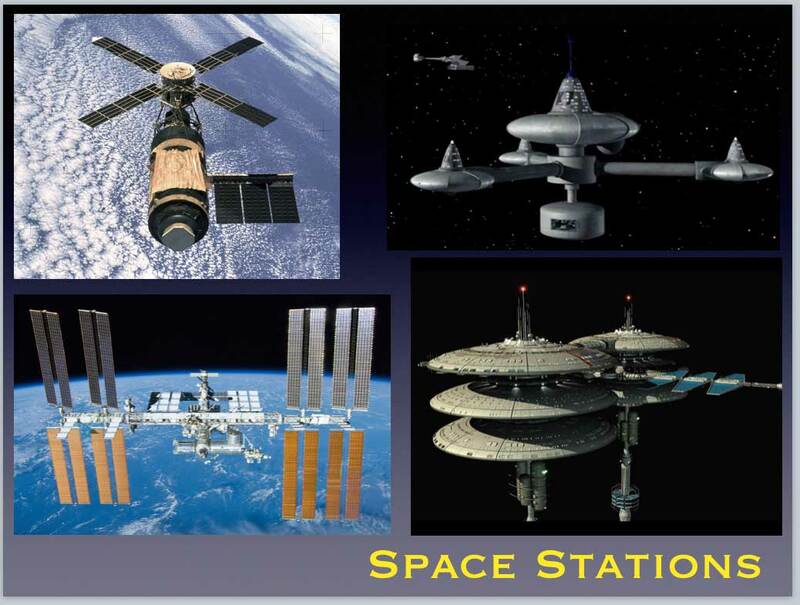 Developments in real-launch vehicles, space stations, and distant planetary spacecraft have all inspired the look of their future versions. Research into new materials and processes, medicines, sensors, computers, and energy systems have likewise driven the look of future handheld equipment. While the real world has been quickly catching up to what we have designed in the Star Trek universe, we continue to learn and ask questions -- and imagine. 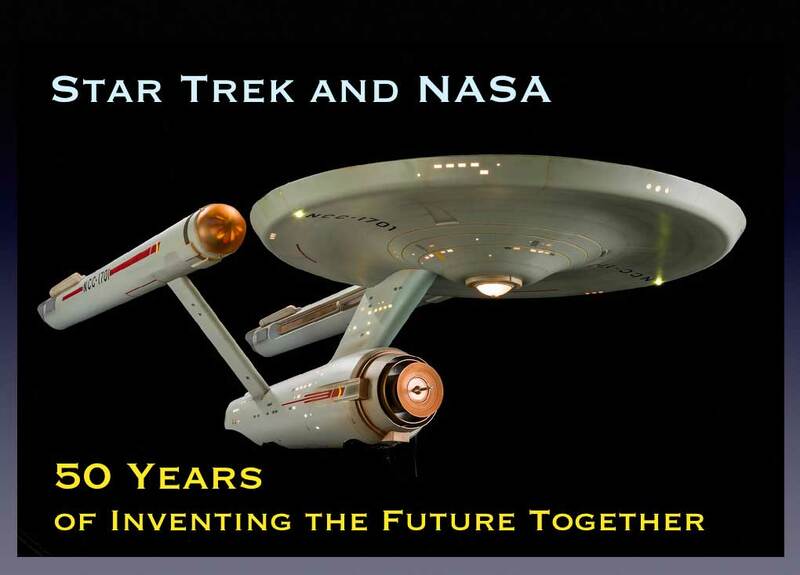 The 2019 Convention is indeed a five-day and night celebration of all the various incarnations of Star Trek that have touched all our lives and changed society in ways no one could have predicted or truly known. The photo above taken at a recent awards ceremony symbolizes what we are working on with our partners to make the 2019 gathering even better. Watch this page as we begin to add to our events. Convening with thousands of fans is just part of continuing the legacy of our mentor Gene Roddeberry. As this is the place to honor the galaxy represented by the Star Trek canon, we are thinking of this theme as we begin to put together our fantastic line-up. 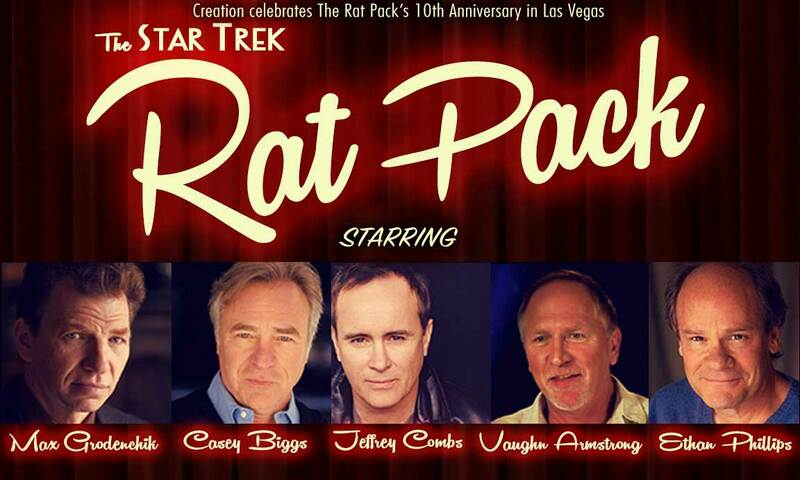 One of the favorite traditions of Star Trek Vegas is the famous STAR TREK “RAT PACK” Show, an original musical comedy performance, written and produced by talented Max Grodenchik (DS9’s Rom) and joined by fellow stars Casey Biggs, Jeffrey Combs, Vaughn Armstrong and Ethan Phillips. It is a witty and warm night of musical comedy, filled with parodies of famed songs with new lyrics by Max. Suggested by attending fans to end our convention with a fun “upbeat” event instead of just waiting for autographs we listened and tinkered with the schedule -- and a new tradition was born! With the STAR TREK “RAT PACK” show set for Sunday night, this will be the last night of the convention to laugh, enjoy, and celebrate Star Trek with fellow fans from around the galaxy. Most of the Star Trek fans would say that the convention week in Las Vegas is unprecedented and unlike any other fan gathering in the world! Our 2018 convention was truly incredible and received worldwide coverage, especially due to super-surprise appearance of Sir Patrick Stewart to announce his return as legendary Captain Picard in a brand new series. 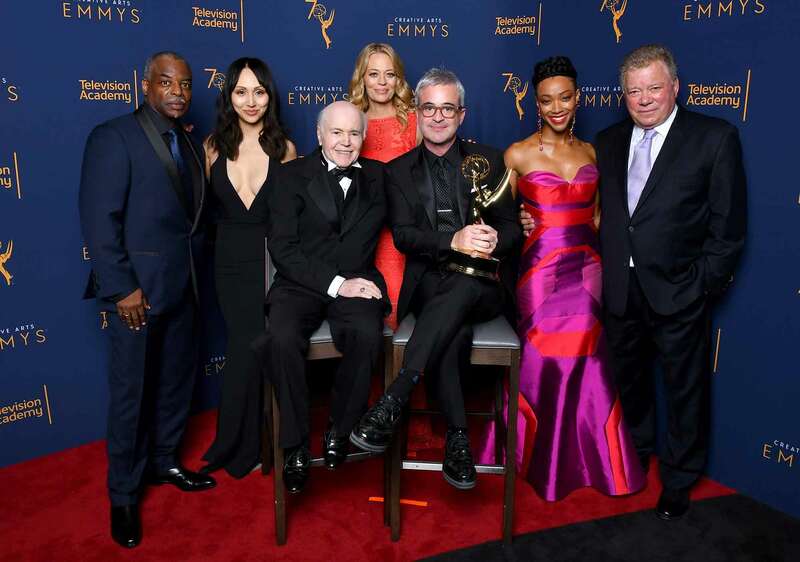 Attendees also warmly received the new cast of Star Trek: Discovery, making them feel so welcomed. The 2018 event also featured over 100 guests, hundreds of cosplayers, non-stop action, and free perks. Plus, there’s the immediate friendships you will make with fellow fans, many that will last a lifetime. With parties and musical performances going way into the night, guest hosts, and the bar scene hopping after as is the casino and The Rio’s wonderful array of dining spots; it is virtually 24 hours a day of all things Star Trek! With Star Trek now in an incredible never before seen pattern of growth and new ventures, this is the best time to be part of the Las Vegas Convention, because you just don’t know what could happen! Of course there is the world’s largest Trek vendors room, signing area, art displays, photo ops, autographs, and re-creations of famed sets from the franchise’s history. And that’s just a small part of the fun, along with changing and new attractions for all. ALWAYS, make sure you are on our FREE Star Trek e-mail list so you know about new guests, developments, ticket launches, and all the latest news! 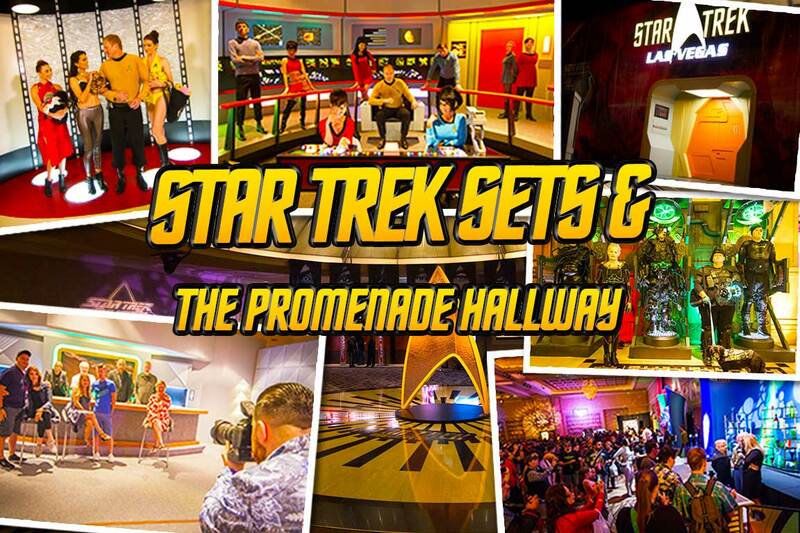 The Star Trek experience continues as you reach the massive Gene & Majel Roddenberry Vendors Room, filled with extraordinary collectables, both new and vintage from the Star Trek Universe. The galaxy's largest Star Trek Convention dealers room and vendors are coming from around the globe to display at this event. You'll find photos, posters, artwork, toys, dolls, games, books and magazines, autographed items, costume and prop replicas, limited edition items and so much more! Start saving now because there will be tons of stuff you will want! And don't forget to meet many fantastic Star Trek celebrities who are present at various times throughout the convention to greet attendees and offer their autographs at a nominal fee. On Saturday, we have our famous Costume Parade to open the day as scores of amazing cosplayers make their way in costume through the convention (including the Vendors Area & The Promenade) and into the main theatre for a group picture. 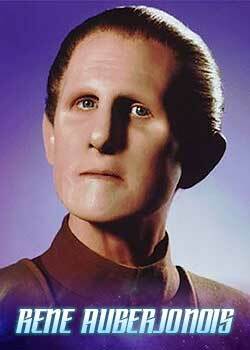 The parade is often lead by a Parade Marshall, typically a Star Trek celebrity! There will be surprises galore, and we certainly love the fact that literally thousands come in terrific costumes. Also, our best advice is to make sure you eat (and the Rio has SO many excellent choices you can’t go wrong) and drink plenty of fluids during your stay – and wear comfortable shoes or sneakers if you can. Besides the main auditorium and registration area, The Promenade Hallway serves as your main focal point for getting to all other areas of the convention, including the Vendors Room. It also has various rooms, special exhibits, some prop replicas, displays and more. It’s a great place to ask a cosplay attendee to allow you to take pictures as there as so many potential backdrops. The studio approves all vendors unless you were approved last year or are an official licensee, so write to us at asponsor@creationent.com with what you want to display and sell! Please do not purchase a booth or table without an okay from us, which we must get from the studio, and note that anything infringing on studio intellectual property is forbidden, as is promotion of any Star Trek fan films. CLICK HERE TO GET FULL INFORMATION ON PARTICIPATING! Are you a talented video editor? A walking encyclopedia of all the exciting moments from Star Trek’s amazing over 50-year-run who thinks, "These would be awesome set to music?" Here is your chance to flex your creative muscles at Star Trek Las Vegas 2019! Winning videos will be played on the big screen at the Official Star Trek Las Vegas Convention, as well as other entries, depending on time availability. 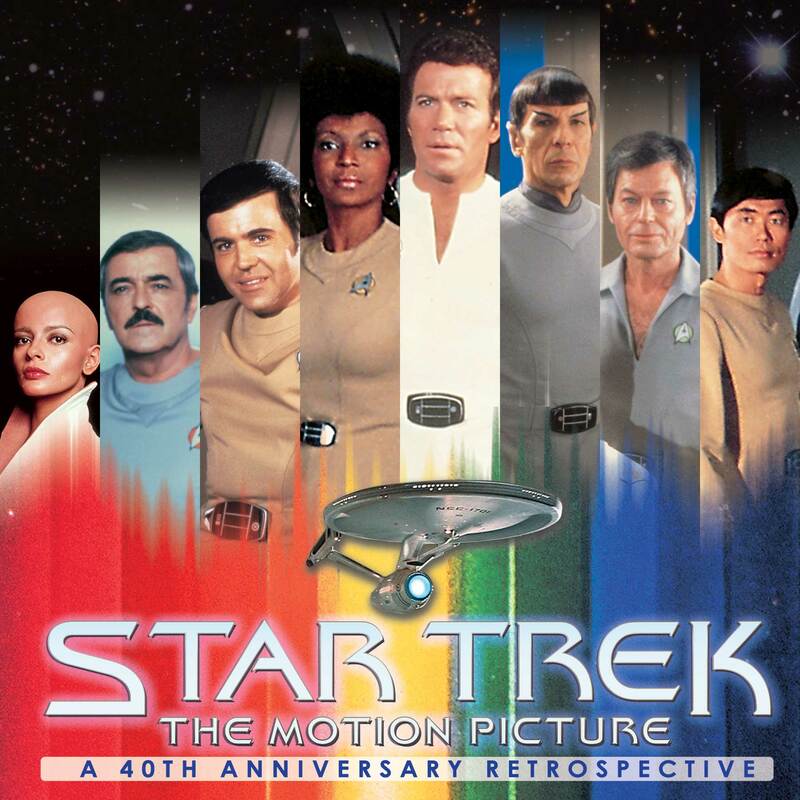 •	One Star Trek music video may be submitted per person, and only one. •	All submissions must be on DVD format in a sleeve or jewel case, or on a flash drive. ONLY NTSC FORMATED DVDs WILL BE ACCEPTED. •	If submitting a flash drive, please make sure all files are compatible with Quicktime. •	In your video submission, you must list the specific convention the music video is for, as well as print your name and the name of your entry (ex: the song name). PLEASE PRINT CLEARLY so we can identify your submission. Illegible submissions will not be accepted. •	Entries are limited to people who are attending the specific event. •	Please keep the submissions under five minutes. •	You do not have to be present for the actual showing of your video, but you must claim your award at the show before the end of the weekend or your award will be forfeited. •	The competition closes 40 days prior to the convention. We will NOT make any exceptions to this. •	Don't forget about the great supporting cast members of the show! 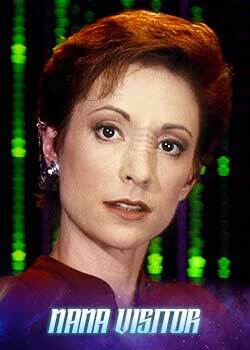 •	We ask that you do not use footage from shows other than Star Trek. •	Entries cannot be returned, and the person submitting the entry is granting Creation the right to play this entry in perpetuity at Creation events worldwide and/or online at the Creation website(s). Creation does not sell music videos so your entry will never be sold as a commercial product, just presented at our events/online. •	Do not submit the same video for multiple events. It will not be considered after its first submission. This also pertains to videos that have been recycled with only minor changes. MAKE YOUR VACATION THE BEST EVER! It certainly seems like EVERY year the famous “Creation Difference” becomes more and more prominent. Creation Entertainment has a strict policy not to "oversell" our conventions. In other words, every patron, no matter what bracket of ticket they purchase, will have a guaranteed seat in the main auditorium where the major guests appear and events take place. There's no worrying or extra waiting to see the celebrities and events you want to see during all FIVE daytime programming in the main and secondary theaters. Another thing we love is that The Creation LAS VEGAS Official Star Trek Convention is in a super-large, friendly hotel! Completely carpeted and filled with award winning restaurants for every budget (including excellent buffets) as well as a dynamic casino, fun bars, and many areas to relax and chill, The RIO SUITES HOTEL allows fellow fans to gather and share common interests and ideals in Gene Roddenberry's philosophies (or just to talk trivia!). We aren’t in a cold concrete convention hall where food lines are mobbed, offer limited fare, and are super-expensive, nor are our crowds uncomfortably huge. It is our goal to offer YOU the very best vacation we can! The very first Creation Costume Contest was held in 1971, and we are proud that the tradition continues stronger than ever! Star Trek fandom certainly boasts some of the most creative and talented costume and make-up designers, and the over 1,500 attendees who participate take their Star Trek cosplay very seriously. They come to the convention in such fantastic and elaborate costumes! Bring your cameras as many cosplayers are open to take pics with you and make great memories. Set on SATURDAY, the fun starts with the FAMOUS CREATION COSPLAY PARADE in the morning, in which cosplayers march around the convention starting at the vendors area and end up in the main theatre for a group photo shot on stage. Then later, the famous STAR TREK COSTUME COMPETITION takes place with a panel of celebrity and expert judges. It’s one of the definite highlights of the whole convention, with lots of cool prizes including a very special $1000 best-in-show gift certificate! Let your spirit shine, come in costume and pump up the experience of The Official STAR TREK Convention, Vegas cosplay-style!